A pair of ravens have taken up residence at Wellesley College, and scientists, students, and bird enthusiasts alike are taking advantage of a rare opportunity to closely observe some of the most playful, social, and fun-loving of wild birds. Wellesley has launched Ravencam, a live webcam that will record the birds' behavior at the nest 24 hours per day for scientific purposes. Ravencam also streams live online and is available to anyone with an Internet connection at www.wellesley.edu/ravencam. 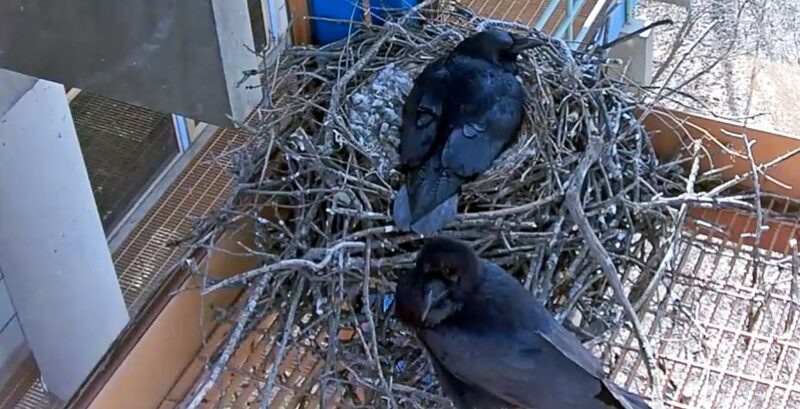 Ravens typically mate for life and this pair has made its nest on the partially glass-enclosed fire escape of the college’s Science Center and laid two eggs that are expected to hatch in mid-April. Because ravens are usually found in rural areas, the presence of their nest on Wellesley’s campus, located within a well-populated Boston suburb, is an extraordinary occurrence. In the Northeast, ravens have been birds of the remote wilds until fairly recently; they have been increasing in abundance in this area since the mid 1970s. No one knows why, says Frost Professor of Environmental Science and Professor of Biological Sciences Nicholas Rodenhouse. "Ours is the first opportunity to closely observe this most creative of birds in close contact with people," he says. "Much can potentially be learned about parental behavior, vocalizations, diet, and more." Though ravens are some of the most often-depicted birds in arts and literature, not much is known about ravens in modern urban environments, and no one has ever before had this kind of opportunity to observe urban ravens at the nest closely. Student researchers will help analyze and interpret the data, with Rodenhouse as their advisor. According to Lauren Johnson '16, who was the first to spot the ravens in October 2013, one of the remarkably unique opportunities presented by Wellesley's Ravencam is the ability to observe the ravens’ behavior at night, thanks the ravens’ choice to nest near existing lighting. “Because the nest area is lit up at night by lights that are nearby, we can actually see the birds sleeping. In their natural habitat, we could not observe the birds at night because it would be dark,” she said. Johnson, who is majoring in biology and Spanish, has been interested in birds since she was a middle-school student researching saw-whet owls in her hometown of Haverford, Pa. Last summer she worked with Rodenhouse on a long-term demographic study of black-throated blue warblers at Hubbard Brook Experimental Forest in New Hampshire. The ravens chose Wellesley College most likely for its cliff-like buildings in a productive landscape. (And, of course, ravens are among the smartest of their kind, whether or not they appreciate Wellesley's vibrant intellectual community.) The Science Center, surrounded by shrubs and trees, sits alongside an open, sometimes damp meadow. Wellesley observers have affectionately named the ravens "Pauline" and "Henry" after Henry and Pauline Durant, the founders of Wellesley College. They stipulated no buildings be named for them, but no mention of birds. Nature is also unpredictable. The projected timeline on the Ravencam page is based on averages. Hatching and fledging will take place on their own schedule. Also, in the worst case, trauma could disturb the birds and make them abandon the nest altogether. Though you can hear their calls from the fields around the Science Center, the best view of the ravens is on the website. The Boston Globe wrote about the ravens in the Metro section of the paper on April 7, 2014.